Your Spanish has gotten to a good level but you could use some pointers on the SUBJUNCTIVE tenses. Sign up below for my FREE email course. 7 Days to Using the Correct Subjunctive Tense in Your Spanish Conversations. You’re not after a quiet life. So clamming up when it’s time to correctly use your Spanish skills… it’s not working. You’re smart, you’re articulate, and you’ve done all your homework. Yet you still feel like you’re struggling more than you should when you try to speak. having the ability to express anything. reaching out to new people and talking to them. 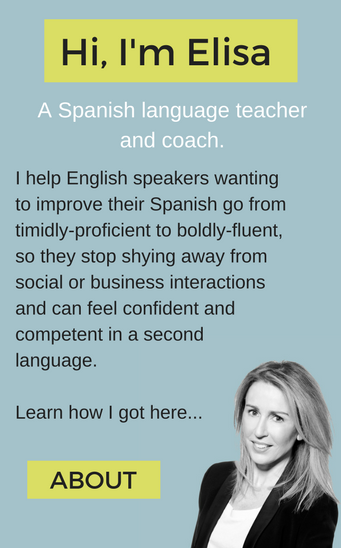 Me llamo Elisa Plaza and I’m here to help you finally communicate well en Español. move to a foreign land. have a working command of the language. work with those Spanish speaking clients. most importantly… sound like you in Spanish. Because anything less wouldn’t be living your dreams. Could You Use Some Pointers on the Subjunctive Tenses? Sign up for my FREE 7 day email course to start learning which tense to use in everyday situations.